for $1,199,000 with 3 bedrooms and 4 full baths. This 3,551 square foot home was built in 2006 on a lot size of 0.2400 Acre(s). $200, 000 price reduction! and a terrific value for this popular floorplan with magnificent mountain views over sparkling lake and fairways. 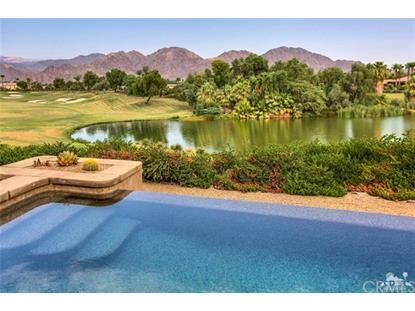 Elevated for privacy above the 8th tee box with a view of the 4th fairway across large pond. Experience the best of outdoor living with infinity pool, spa, water feature and fire pit. Those fabulous mountains wrap the home with views with sunlight playing over them through the day. This is the popular Cordoba floor plan with great flow: gourmet kitchen with cooking grotto, great room and butler pantry to formal dining room. Master Suite has views and privacy. Luxurious bath retreat, his and her closets. Lucky guests have a two room casita off the elegant entry courtyard. This casita can actually be used as 3rd and 4th bedroom guest quarters or 3rd bedroom with sitting room, complete with fireplace. Terrific pricing for this gorgeous view lot. Seller wants Offer! Proudly represented by Bergsma-Triscari Team, Pacific Sotheby's Intl Rlty.